Explore Namibia on this 10-day safari! Visit one of the oldest deserts in the world, the Namib Desert, and the Skeleton Coast. This safari is truly an adventure. Traveling through some of the most remote areas of the this land makes this vacation a discovery for everyone. Take a day or night nature drive, view both land and sea-based wildlife via flying, driving, or boating. Climb one of the world’s tallest dunes, try rhino tracking, or perhaps view shipwrecked remains on the desolate Skeleton Coast. From Sossusvlei to Swakopmund to the Skeleton Coast, venture well off of the tourist path on this epic, ten-day expedition encompassing the best that Namibia has to offer. Head to Pelican Point to see the lighthouse and an area in which three species of dolphins may be encountered, namely the rare endemic Heaviside's dolphin as well as the dusky and Atlantic bottlenose dolphins. Damaraland has the highest concentrations of desert elephant and black rhino. Brandberg Mountains, Damaraland offers its guests endless vistas and one of the best wilderness areas in Namibia. Explore the famous red dunes of Sossusvlei and the 37,000 acre private reserve where you will discover line in one of the world’s oldest and most arid deserts. Our Light aircraft transfer to Swakopmund Airport is in fact a spectacular scenic flight (weather permitting) that flies over the only well-preserved shipwreck in namibia, endless dune fields and even an old diamond mining settlement. Discover the town of Swakopmund and bed down in the historic Hansa Hotel that forms part of the city’s architectural culture. On Day 4, we explore the ice-blue Atlantic coast on a boat cruise (weather permitting) as well as the imposing Sandwich Harbor dune fields on 4×4. The adventure is rounded off with a private seafoodlunch before driving back to Walvis Bay. The Hansa Hotel – nestling in the very center of the charming little town of Swakopmund, wrapped in the shape of a timelessly classical building dating from 1905, and integral part of Swakopmund’s architectural heritage, offers you a feeling of being enveloped in a luxurious and sophisticated hospitality with a satisfying blend of both classic atmosphere and truly elegant interior, matched with friendly and personalized service. We continue our journey by road for approx 236 miles up the legendary Skeleton Coast (named for the numerous ships the treacherous shores have claimed over the years). You can expect to see the fascination lichen plains at Wlotskasbaken, remains of the Zelia shipwreck near Henties bay and the SW Seal shipwreck near Ugabmund. We also take in the ghostly remains of mining operations near Toscanini. Driving time is about five hours, plus time for stops. Terrace Bay Lodge is situated in the Skeleton Coast National Park in north-west Namibia. As the only accommodation in the Park itself, Terrace Bay is a popular destination in a remote location. This rustic rest camp has 20 comfortable en-suite rooms and a family chalet, while the bar and restaurant are convivial areasin which to meet fellow guests and discuss the exciting day’s happenings. This is also a destination for the angling crowd as the chances of catching a variety of fish here are amongst the best on Namibia’s coastline. *Please note that whilst accommodation is clean, functional and comfortable, it is not a luxury lodge comparable to Wilderness Safaris camps. We continue through the Skeleton Coast National Park to Mowe Bay Museum and the stop and admire the remains of the Suiderkus shipwreck. Other attractions are the Klein Oase ad Auses Springs hidden in the dunes, an intriguing “roaring” dune and spectacular desert scenery combines with whatever desert-adapted wildlife presents itself. The distance to camp is only 86 miles, however, given the gravel roads the driving time is approx. 5 hours. Set in the starkly beautiful Palmwag Concession on the border of the legendary Skeleton Coast National Park, Hoanib Skeleton Coast Camp offers a unique experience of one of the most remote places on Earth. Eight stylish, well-insulated en-suite tents with shaded outdoor lounges are laid out against a rugged backdrop of hills and overlook a broad valley at the confluence of two tributaries, providing breathtaking vistas over the highly photogenic landscape. A small plunge pool awaits you after summer activities, while a winter lounge provides a cosy respite from the icy Atlantic fog when it settles over the coastal plain. Another exciting day on the road to Desert Rhino Camp through the rugged, rocky and mountainous Palmwag Concession brings with it the opportunity of seeing giraffe, oryx and dry riverbeds. At Desert Rhino Camp, you can take part in a thrilling and exclusive conservation success story. Tracking Africa’s unique and endangered desert-adapted black rhino is an unforgettable experience. To set the scene, you will be shown into one of the eight en-suite Meru-style tents elevated off the ground. You can absorb the panoramic views over the rolling, rocky hills beyond from the privacy of your veranda. Full-day excursions are on offer; otherwise, between activities, relax in our tented living area. Evening meals are taken around the fire pit. 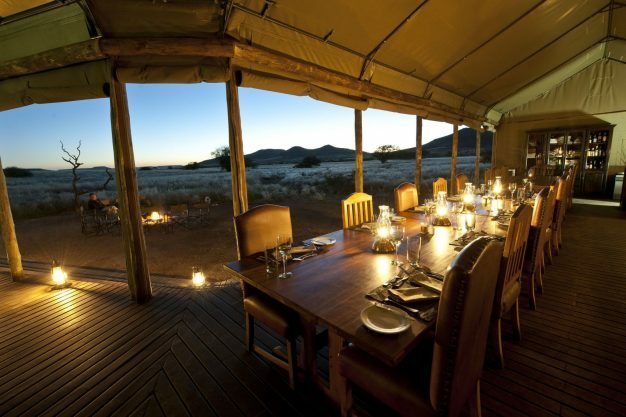 As a wonderland of unusual plant life, fascinating wildlife and sparse wilderness, Desert Rhino Camp is begging to be explored. We bid farewell to our adventure as we transfer to the Doro Nawas Airstrip to return to Windhoek.